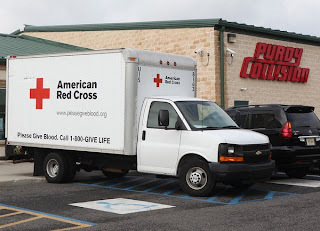 GALLOWAY TOWNSHIP, NJ (August 19, 2013) –For the second straight year, Kline Construction Company, Inc. has teamed up with Purdy Collision Center to organize a blood drive scheduled for September 3 in response to the severely depleted blood supply in Southern New Jersey. Hundreds of Kline Construction workers and business partners will be rolling up their sleeves to donate, along with hundreds more expected as the drive is also open to the public. While providing construction and traffic safety services to improve New Jersey’s infrastructure is his business, the true passion of Kline Construction President, Ed Kline, is in serving his community. It's that spirit to serve that has inspired his management and workers to partner with the American Red Cross to organize the blood drive. Kline’s facility doesn’t have the space needed for the drive so Galloway Township Mayor, Don Purdy, sprang into action and offered his showroom at Purdy Collision Center. The Blood Drive will take place on Tuesday, September 3 from 6:30am to 11:30am at Purdy Collision Center (805 Third Avenue, Galloway). Appointments are preferred. For an appointment or information, please contact Ron Muchnick by calling (609) 652-3000 or sign up online at redcrossblood.org (Sponsor Code: klineconstruction). For more information on participating in blood drives call 1-800-Red Cross. see this website does report positive things on the mayor. Wow one press release but what about the 20 or so comments on this site accusing him of committing a crime. That is decimation whether he is an elected official ord not.